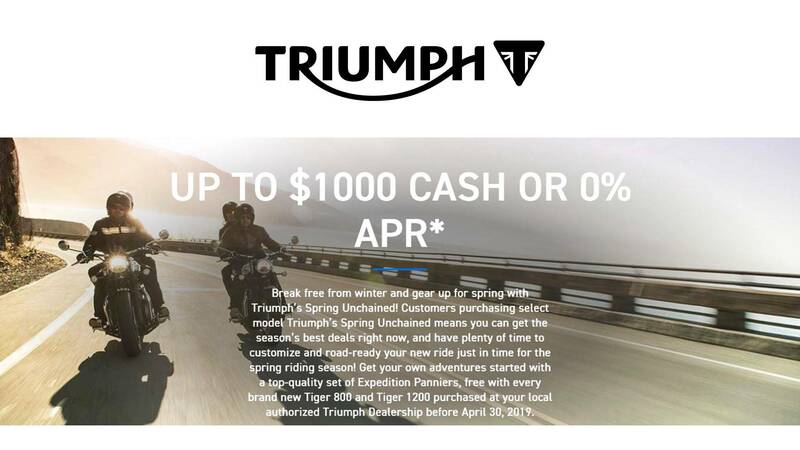 RIDE INTO SPRING SALES EVENT. SAVINGS OF $2,151. CALL (714) 256-6700 FOR DETAILS. HIGHER SPECIFICATION SUSPENSION : The new Street Triple range is fitted with a higher specification suspension all round, developed and turned specifically for the new models. 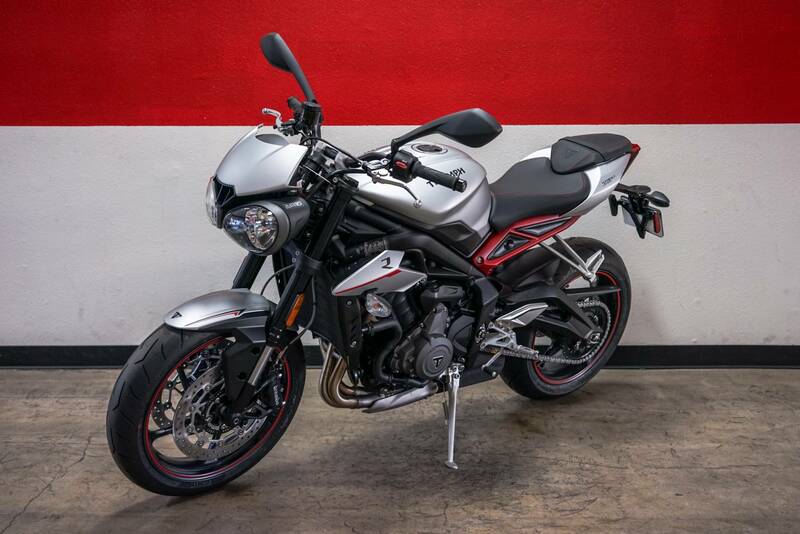 The Street Triple S comes with Showa upside-down 0 41 mm separate function front forks 110 mm travel and a stepped preload-adjustable piggyback reservoir monoshock rear suspension unit. The Street R comes with 0 41 mm upside-down fully adjustable Showa separate function big piston front forks with 115 mm travel improved riding comfort without compromise and a Showa piggyback reservoir monoshock rear suspension unit. 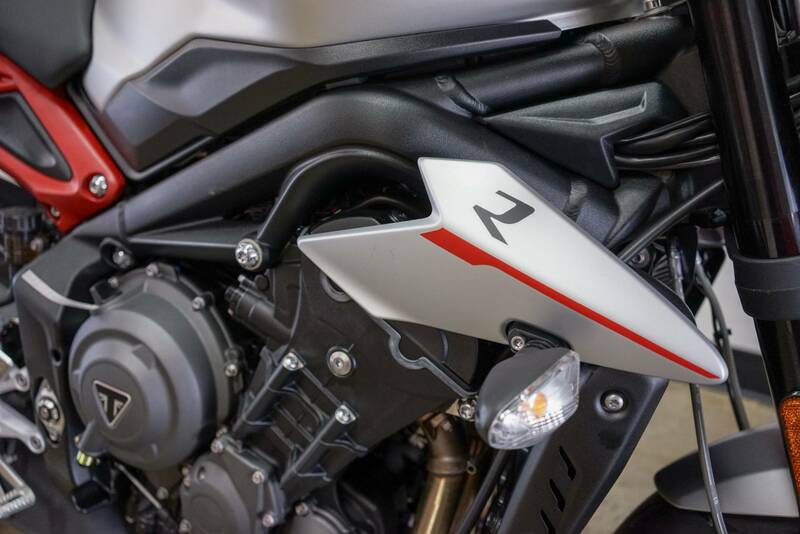 And the Street Triple RS comes with the highest-specification Showa big piston 0 41 mm front forks, adjustable for preload, rebound and compression damping. The rear suspension unit is a premium Ohlins STX40 piggback reservoir monoshock. 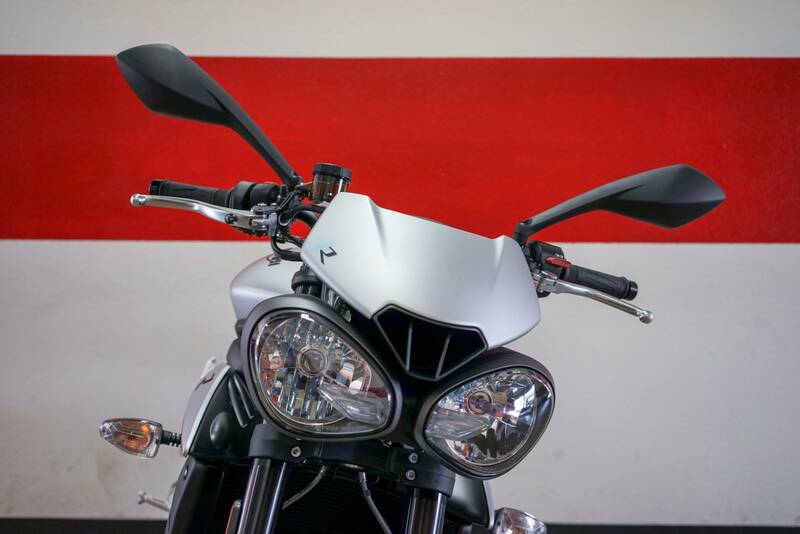 MAXIMUM HIGH SPEED STABILITY: An all-new gullwing rear swingarm has been specifically designed for the new Street Triple range, resulting in increased longitudinal torsional stiffness, combined with an engineered reduction in lateral stiffness. This maximizes stability at the higher speeds achieved by the ew Street Triples, for greater rider confidence and safety for a more natural resistance to compression of the rear suspension unit under hard acceleration. 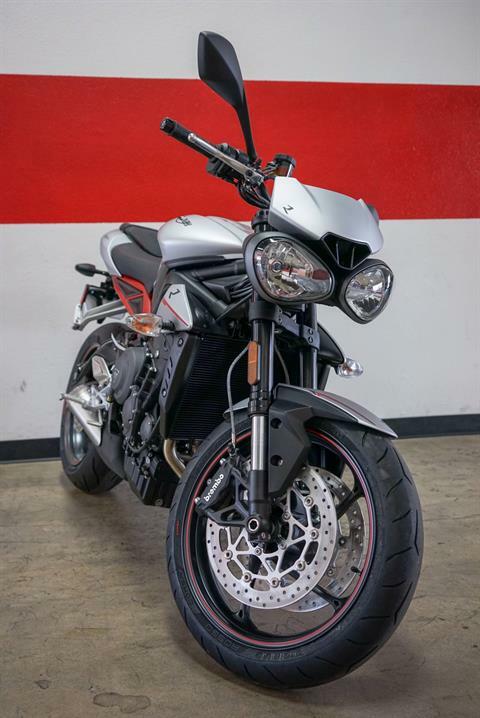 This delivers tighter corner exit capability and a more precise chassis behavior, which can be felt on both road and track. RIDE-BY-WIRE: The new ride-by-wire throttle on each of the new models delivers a crisper, more precise and more accurate throttle response, with improved on/off throttle transition. It also enables different throttle maps which, combined with the ABS and traction control settings, provides up to 5 selectable riding modes. 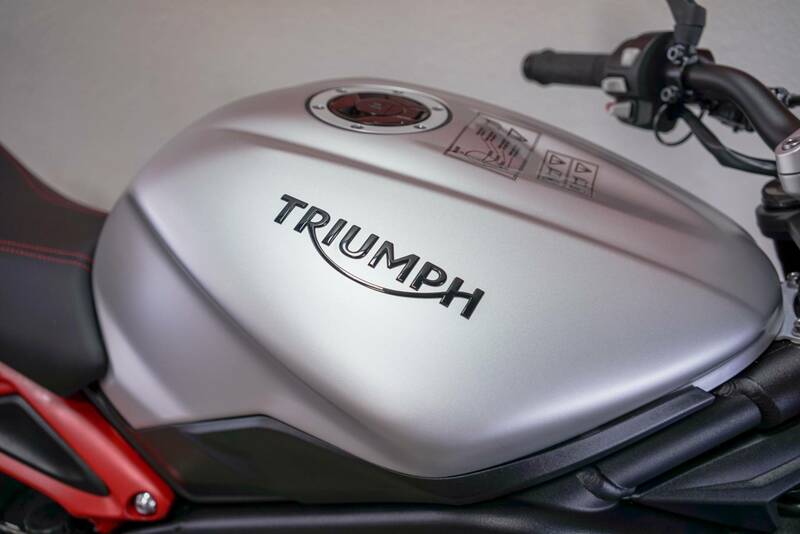 RIDING MODES: Linked to the ride-wire system the new Street Triples have much greater rider control with introduction of riding modes which adjust throttle response, ABS and traction control settings at the touch of a button - either at a standstill, or on the move. 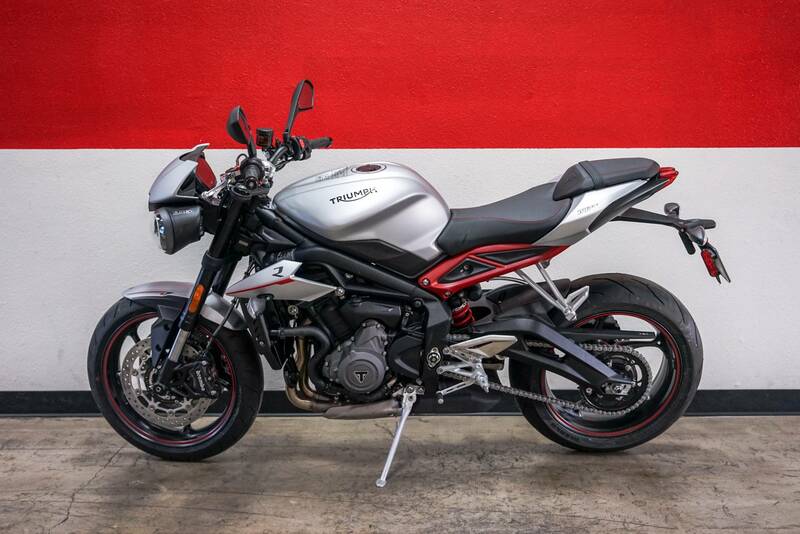 The street Triple S delivers 2 modes with 'road' and 'rain'. The Street Triple R delivers 4 modes in total with the addition of 'sport' and 'rider programmable' mode. 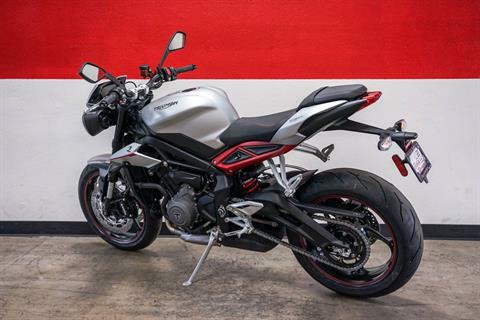 The Street Triple RS delivers the highest level with 5 modes to choose from with the addition of a 'track' mode. NEW ON-BOARD COMPUTER: The all-new on-board computer gives the rider access to all key information via the TFT screen. 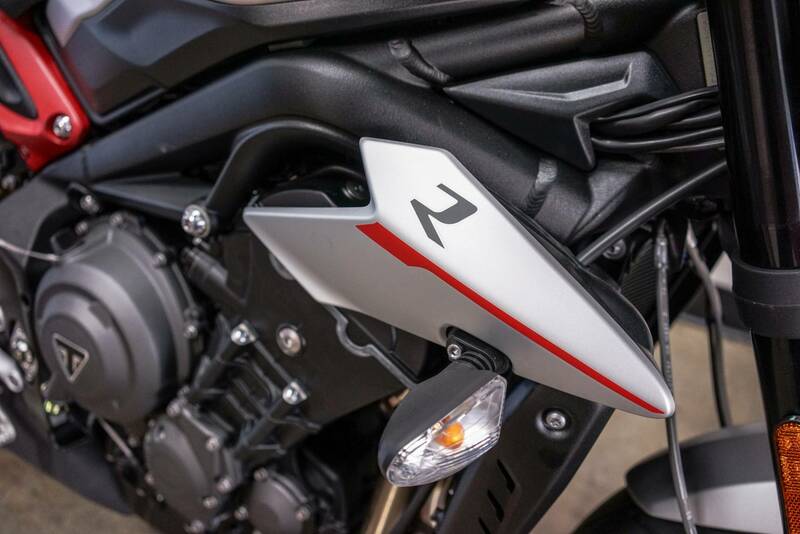 For the 'S' model these include, speedometer, rev counter, riding mode symbol, gear position display, fuel gauge, odometer, trip meter and journey distance. The 'R" ad 'RS' models present additional features including two trip displays, average and instantaneous fuel consumption, range to empty, riding mode selection, display style and contrast settings, service information, coolant temperature, warning, symbol information and exclusively for the 'RS' model a lap timer. NEW SWITCH CUBES WITH 5 WAY JOYSTICK: To navigate the new instruments on the Street R and RS there are all-new switch cubes with an intuitive 5-way joystick control to be easy to use either on the move, or at a standstill. 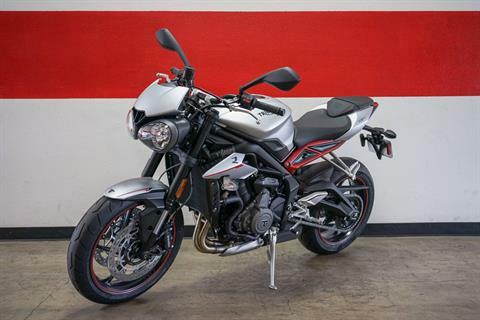 The Street Triple 'S" features the revised switch cubes set-up from the latest generation Speed Triple. ABS: The latest generation anti-lock braking system brings a new level of control on all models. 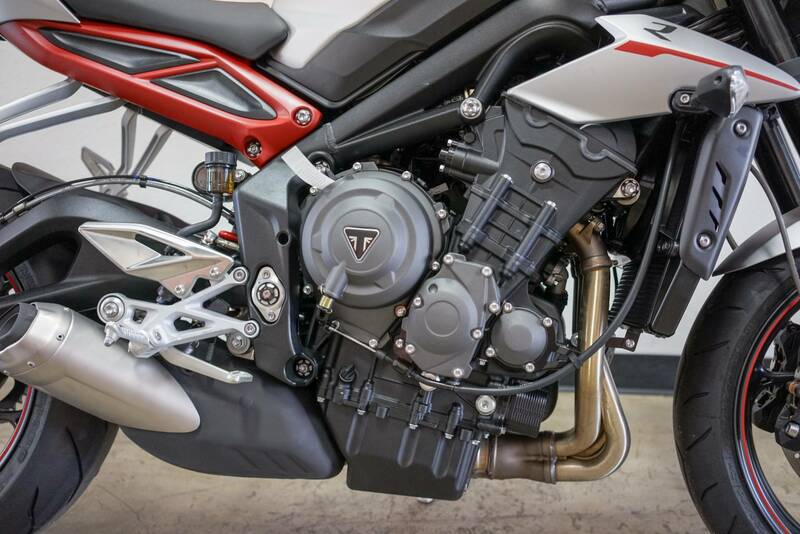 The ABS is also switchable on the Street Triple R and RS through the 'rider' programmable riding mode, which can be adjusted to suit (road and track modes) or turned off completely if desired. 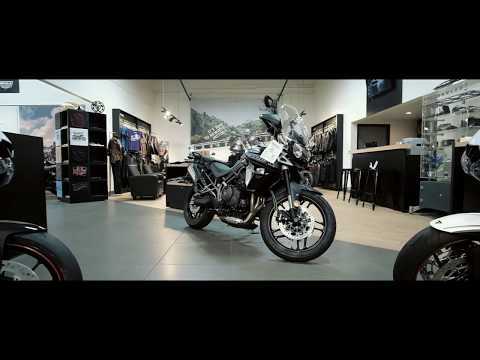 SWITHCABLE TRACTION CONTROL: Traction control manages both the power and torque when traction is compromised, maximizing rider safety and control. The traction control is switchable on all models. On the Street Triple S it can be managed via the instrument menu, by selecting 'road' or 'rain' riding modes-each with a dedicated traction control setting built in. On the Street Triple R and RS traction control can be managed through the 'rider' programmable riding mode, by selecting the desired traction control setting-'road', 'rain', 'track', 'sport', or 'off'. GEAR POSITION INDICATOR: The street Triple R and RS feature a useful gear position indicator, accessible through the 5 in. full cooler TFT instruments. 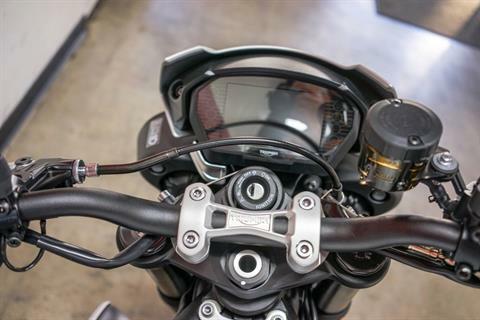 QUICK SHIFTER: The new Street triple RS model is fitted with a quick shifter, allowing for clutchless upshifts of up to 2.5x quicker than a skilled rider using a standard clutch upshift. 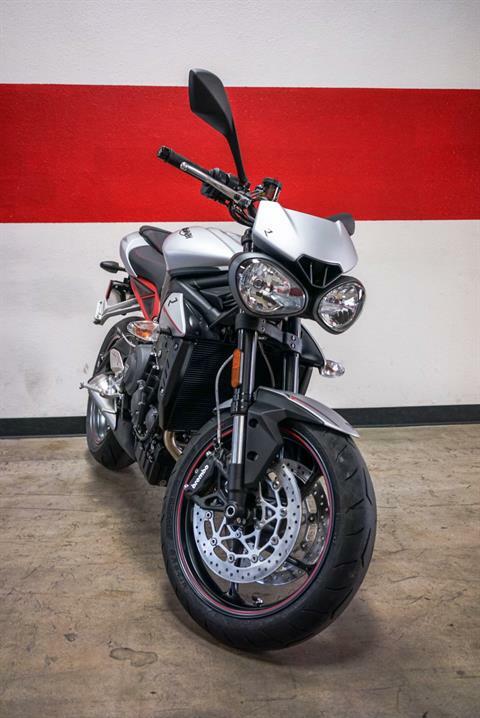 The Quick shifter feature can also be added as an accessory option on the Street Triple S and R.
DRL HEADLIGHT: The new Street Triple line up all feature new headlights designed for a more aggressive stance. 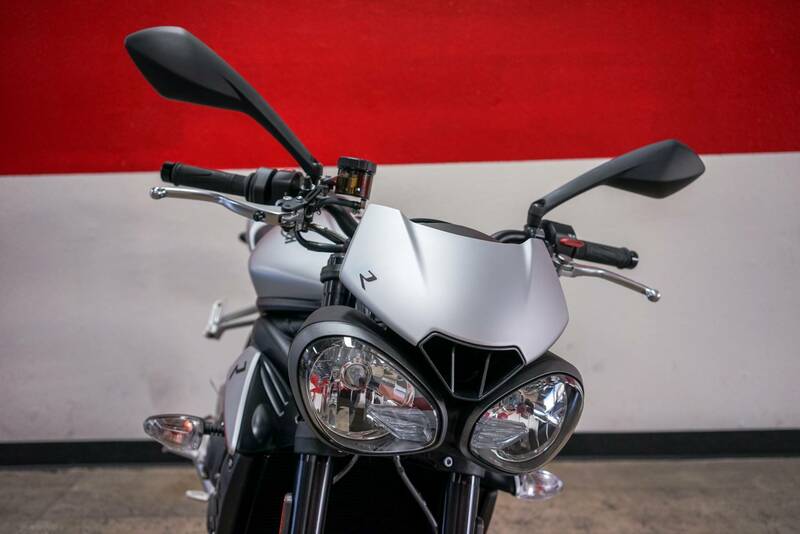 The Street Triple R and RS feature distinctive LED Daytime Running Lights (DRL*). These bring a ew eye catching light rofile that makes the bike more easy to see out on the road and a lower energy consumption for greater long term durability. The DrL is an amazing 28x brighter than the previous generation bulb sidelight. LIGHTER, MORE AGILE AND BETTER HANDLING: Leaner and meaner than ever, the new Street Triple models are lighter than the previous generation, holding their position as the lightest bikes in class. The weight reduction combined with the new higher power 765 cc engine delivers an amazing power to weight ratio that is key to the game changing performance of the new 'Streets' delivering a truly explosive, agile and exciting ride. INCREDIBLE STOPPING POWER: The new Street Triple line up all come with a higher specification brake set-up than the previous generation. 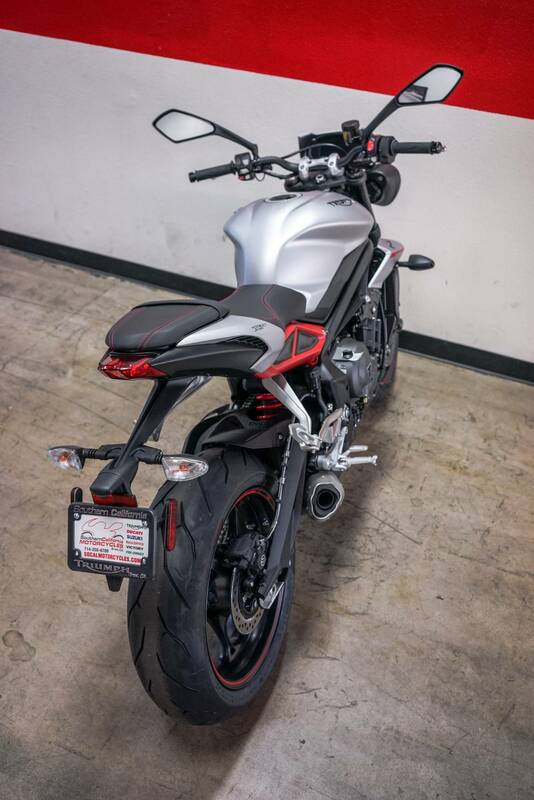 The Street Triple S model is fitted with Nissin 2-piston sliding caliper on the back. 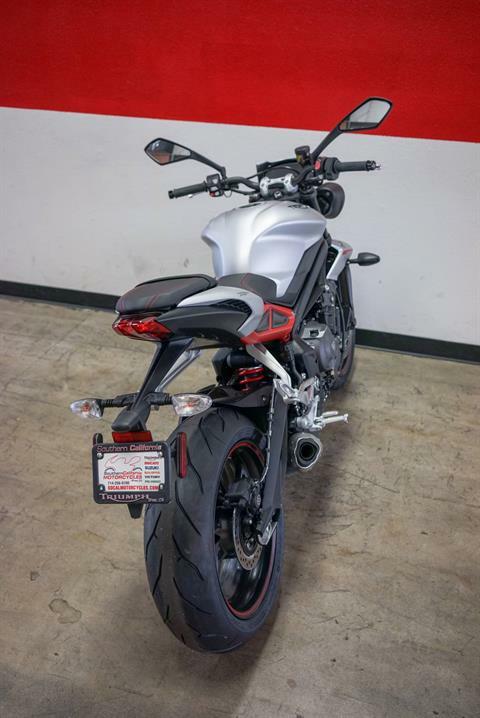 The Street Triple R has Brembo M4.32 4-piston radial monobloc calipers that deliver greatly improved stopping power over the previous Street Triple R and Brembo single piston Sliding caliper on the back. 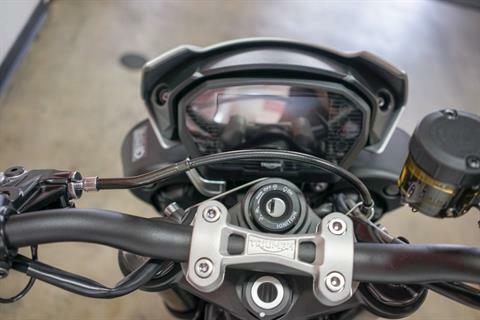 And the street Triple RS has range topping Brembo M50 4-piston radial monobloc caliper on the back. 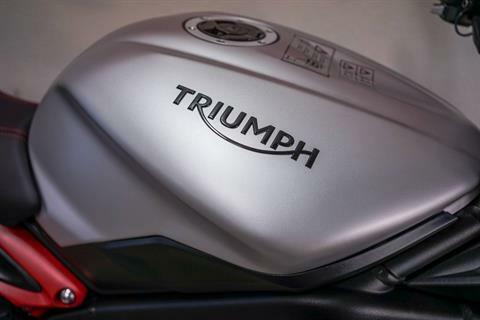 HIGHER SPECIFICATION TYRES: High specification performance tyres have been fitted to the all-new Street Triples to compliment their higher performance and sporting prowess. The Street Triple S and R models are fitted with premium Pirelli Diablo Rosso Corsa tyres which deliver sharp and precise handling as well as excellent stability and grip and on the road. 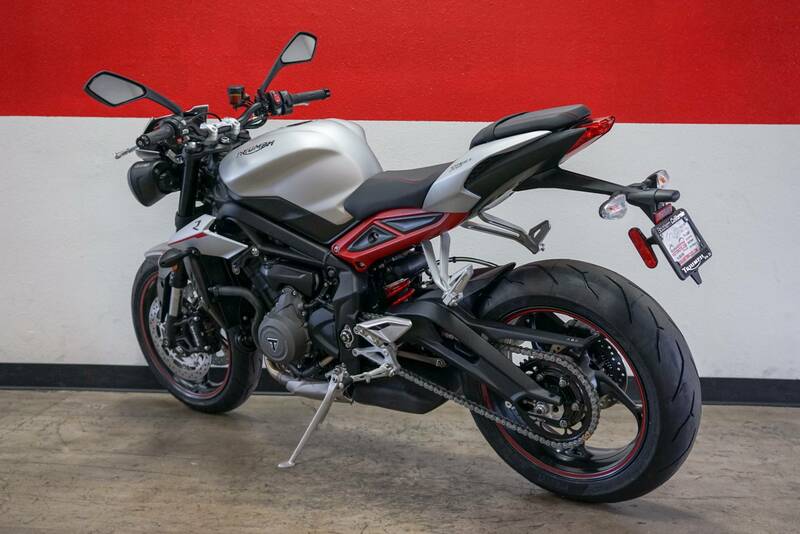 The Street triple RS comes with range tipping Pirelli Diablo Supercorsa SP tyres, that deliver advanced sporting performace for road and the occasional track use. ACCESSIBLE SEAT HEIGHT: All of the new line-up maintain the Street Triple's reputation for comfort and ridability with a truly accessible seat height. 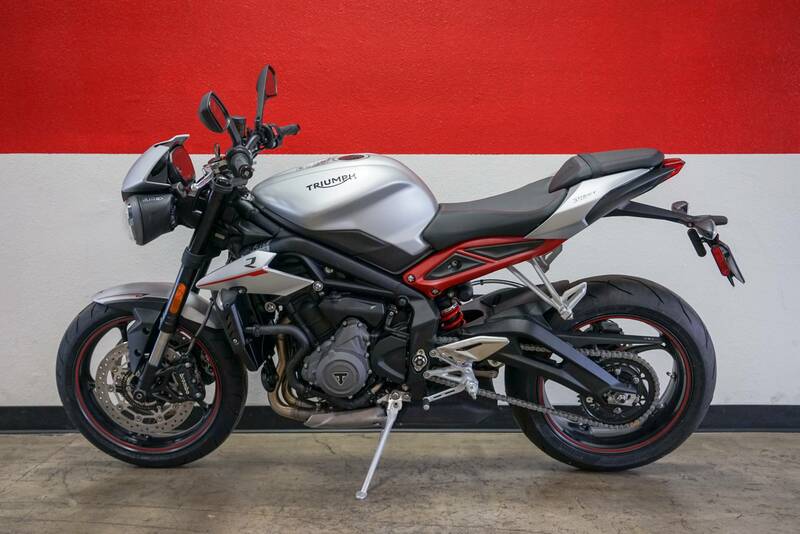 The Street Triple R Low Ride Height (LHR) version brings an even greater level of accessibility for every rider. 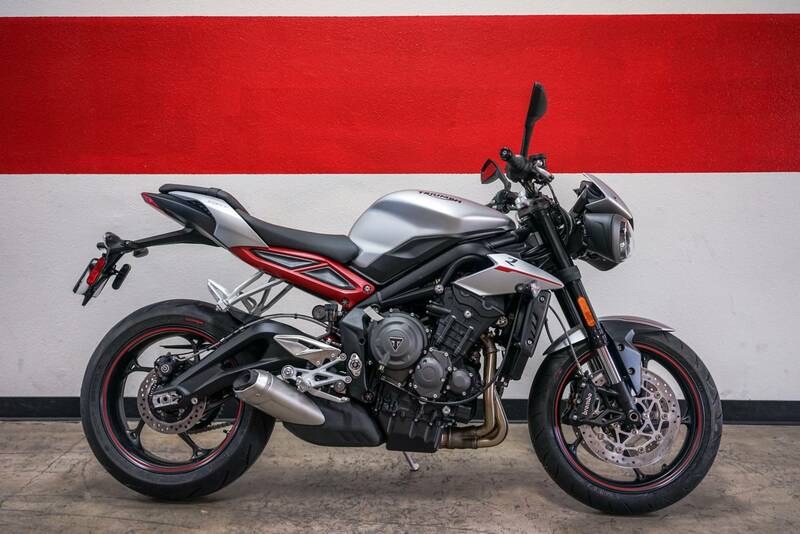 NEW BODY WORK AND CONTEMPORARY DETAILING: The new Street Triple range features all new more contemporary and sharper styled bodywork with stunning detailing, including new radiator cowls front and rear mudguards nd rear body panels. A new body colour matched fly screen has also been introduced, along with an integrated air intake, derived from the latest generation Speed Triple. This comes in two versions designed to suit the different rider and riding styles. On the 'R' and 'RS' models the fly screen has a more aggressive, sharper and sportier profile. On the 'S' model the fly screen has a more road focused profile with greater aero protection. 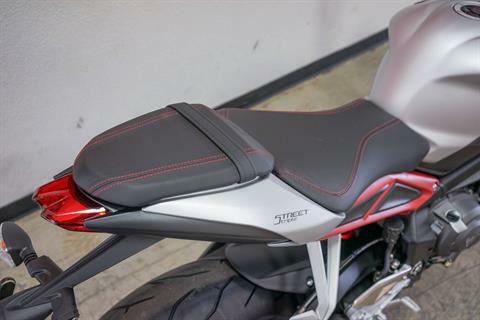 The Street RS has an even higher level of finish with colour coded belly pan, colour coded pillion seat cowl with interchangeable pillion seat (as standard) and lower chain guard. 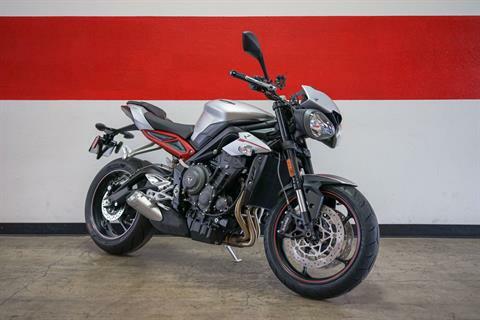 SHARPER AND SPORTIER TWIN SEAT DESIGN: The new Street Triples all feature an all-new sharper, sportier twin seat design, that has been inspired by the Daytona R with no compromise to comfort. 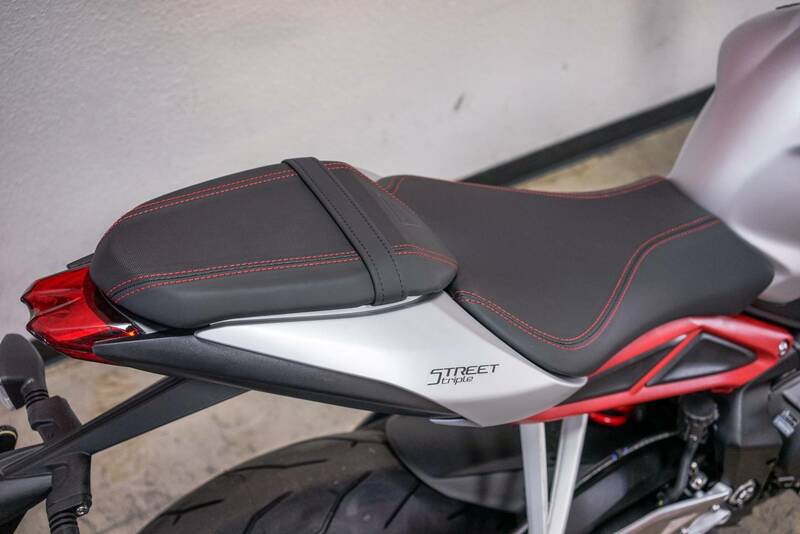 The Street Triple R and RS models have an enhanced premium material construction, finished with elegant seat stiching. 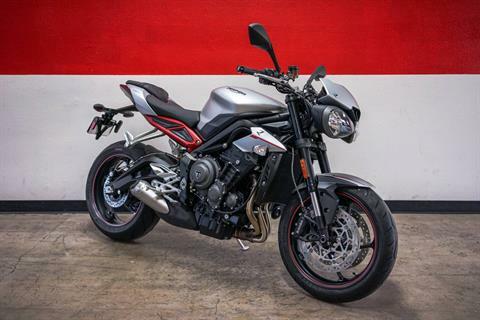 HIGH QUALITY DETAILS AND FEATURES: The new Street Triple range is packed with high quality details, including new rider heel guards and forged pillion footrest hangers, giving each a more individual style. The Street Tiple S has a black powder coated main frame, sub-frame and swingarm. The Street Triple R features Triumph's signature red Rear sub-frame and wheel pinstripes, and the Street Triple RS has all-new matt aluminum silver painted rear sub-frame. 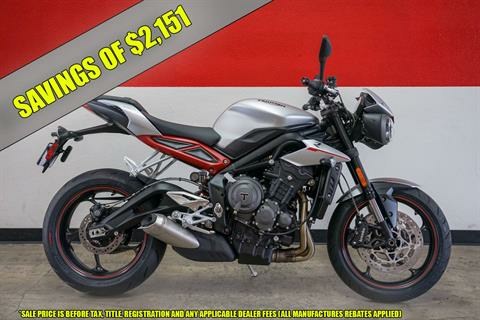 MORE ATTITUDE, SHARPER STYLING AND A MORE ATHLETIC POISE: Tej mew Street Triple 'nose down focused attitude', with enhanced contemporary and aggressive lines, new bodywork, a new sportier twin-seat design and the highest level of finish throughout. Full-colour, 5 in. TFT instrument pack with 3x styles and high/low contrast options.